Creating a startup is exciting, nerve-wracking and overwhelming all at once. There’s so much to do — logo, branding, website. And then of course there’s all the marketing. But the one thing I see startups failing to do time and again is devoting time (and money) in developing their startup brand identity. Branding isn’t all about your colours, logo, typography or even your website. 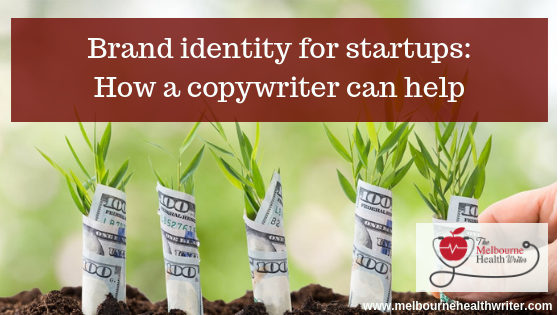 Brand identity goes well past the visuals, and believe it or not, copywriters can help you enormously when it comes to identifying your brand voice. Why is branding important when working with a copywriter? It’s true that copywriters can write awesome copy for your business. But some of us (like me) can help you establish your brand identity too. This is probably the most important thing you need to do BEFORE asking a copywriter to write for you. Because your branding is you. It’s your business. It’s what you believe, your values, your personality and the kinds of words you use, to convey all of that — whether it’s an email, a website, or a press release. Without this information, even the most brilliant copywriters will fail to produce copy that you’ll love. A couple of years ago, I worked with a client who hadn’t taken the time to develop her brand identity. Warning bells sounded in my head, but I was a lot greener back then, and ignored them. However, I should have listened because the project was fraught with problems. First of all, she was trying to merge 4 different businesses (not services) into one business. Because of this, her target market was extremely diverse, which made it very difficult to write copy that would engage everyone. Secondly, she wasn’t clear on what her key messaging was. It only became evident half-way through the project that her prime motivation was purely to sell her services and her ‘stuff’ to make money, but she hadn’t sat down to think about how her offerings made a difference to other people. Her focus was purely on ‘flogging’ her business. Once again, this made it very difficult to write copy that would engage the audience. Thirdly, she couldn’t explain her business to me. She could tell me what she did, but she couldn’t tell me why she did it, how she did it, and why she was different to everyone else who was doing similar things. She expected me to do a lot of research into her field of work, and when I asked her specifics about her business, she couldn’t give me straight answers. Finally, she had no idea on her business values or personality. She was extremely inconsistent with feedback on the copy I wrote — liking one thing, but then not liking it in another area of the text. It wasn’t until I heard the dreaded words “I’ll know it when I see it”, that I realised that I was never going to be able to deliver the copy that I wanted to. To cut a long story short, I wrote copy that the client was happy with — but I wasn’t happy. I knew it wasn’t going to hit the mark, nor stand out. And that was because the client had come to me unprepared. While this was a difficult project to work on, it taught me the importance of only working with clients who know what they’re about, and what they want. Research shows that startups rarely address developing their brand identity early on. It’s usually after failed marketing attempts, and when things are looking grim, that they realise they need to develop a stronger brand. However, this is much more difficult to do, than developing a brand identity from the start. Great brands have purpose. They know who they are, what they stand for, and what their key messages are. If you want your startup to become a great brand, you need to spend time developing your brand voice. This is also known as your Tone of Voice Guidelines (TOV). In short, your TOV defines your business, so all you come into contact with know who you are and what you’re about. I also include a Style Guide and some extra tips about writing. Pretty cool, huh? But the best part of developing a TOV guidelines with me, is that once we’ve done that, I’m able to nail whatever copy you need me to write. Clients who have developed their own TOV guidelines with me have had very minimal (if any) changes to the copy that I have produced for them. Now of course, startups need more than just some TOV guidelines to get them started. Many need SEO-optimised web copy, blog posts, business letters or even content plans. Fortunately, I can help you with those as well. In fact, I’ve helped a number of startups get started (excuse the pun), so I’ve put together a special package — just for startup companies. And because startups don’t have huge budgets, this package is designed to give you value for money. Tone of Voice Document (including Style Guide) which will to bring a greater clarity and consistency to the copy, and help customers understand the brand and navigate through your offering more easily. It includes all the things mentioned above. This is a 35+ page document! Keyword research to determine keywords to target for SEO purposes. SEO-optimised web copy for 3 pages (Home, About, Services) which includes writing of all meta titles, tags and descriptions. This is the perfect size website to get started. All that for the low price of $2,395. If you’re ready to get started, click here. Of course, if you’re not ready for the whole package, or you’d like to add on extras such as extra web pages, blog plans, blog posts, media releases or business letters, please contact me for an obligation-free quote. Remember, if you want your startup to be a serious contender in the market place, don’t forget your business branding. It’s an investment that you simply can’t afford to skimp on.